The Family Sangha is a regular community event that meets most months. Whether or not you have meditated before, we would love for you to join us for one of our mornings of mindfulness which we are currently holding once every two months on a Saturday at the Wandsworth Quaker Meeting House near Clapham Junction. Together we practice a guided meditation, mindful movements, dharma reading and sharing, in the tradition of Zen teacher Thich Nhat Hanh. Children and teens will join adults for part of the morning and will then have parallel programs facilitated by young people from Wake Up London. Our aim is to create an inter-generational morning of mindfulness for people of all ages to come together as a mindful family. 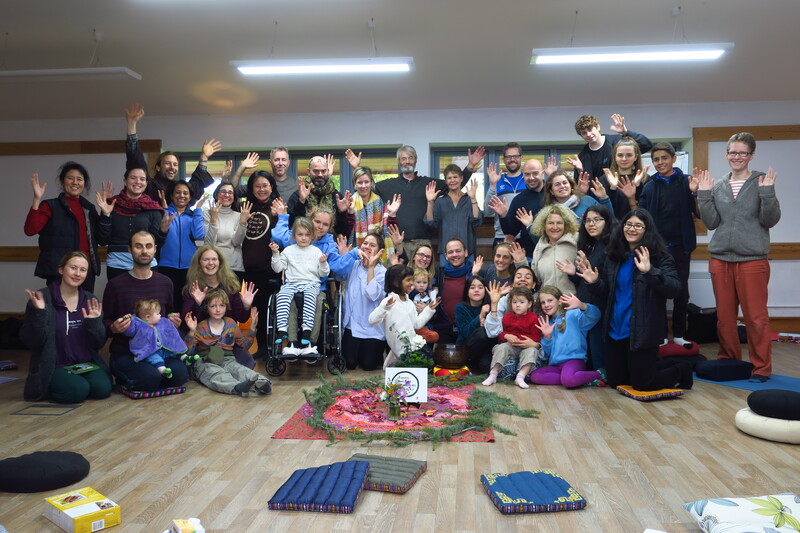 Our experience of all age family meditation groups on retreats has been of creating wonderful connections across age groups, and we believe that children benefit from a loving, spiritual community just as much as adults do. We welcome people outside of London to join us for this event. Please contact us to let us know if you would like to join our mailing list and find out when our next event is. People of all ages with or without children are welcome to come. All children must be accompanied by an adult. We really look forward to practicing together and building connections. We’d be grateful if you could take a moment to share about us with sanghas you know, families and people of all ages who would like to participate. For newcomers, please click here to join our mailing list. Such a beautiful space for families of all ages to come to practise and play together in a nourishing and wholesome environment! Really well organised and in a lovely building! Thank you to you guys for organising and creating this oasis for families in the big city! The food was great, too! I love the Family Sangha, it is a place of joy, love and peace. This mindful community helps me to keep up with my practice and to introduce mindful living to my children. Thank you to all for creating such a nourishing, welcoming and supportive space.